is a prominent Gay rights activist and a drag queen. Friends, supporters and members of Lesbian, Gays, Bisexual and Transgender (LGBT) community should start planning for a marquee festival of the community in Ireland. Named as The Outing, this music festival also doubles as a matchmaking festival and is held in Lisdoonvarna, County Clare, in the West of Ireland. The town has a population of just over 800 residents! Expect a vibrant atmosphere as gay men, women, trans, drag queens and people from all walks of life from across the world indulge in nonstop revelry. Many members of the community also head here looking for perfect partner for themselves. The festival will be held from October 7 till October 9. While The Outing remains a celebration of LGBT community but it is also one of the best music, arts and film festivals to attend. It is slowly acquiring a cult LGBT event status across the globe. This is festival's fourth year and like every year expect thousands of travellers to descend on this quaint yet picturesque village. The main attraction of this year’s event will once again be High Queen of Drag in Ireland, Panti Bliss, who will also do matchmaking alongside Lisdoonvarna’s own legendary matchmaker Willie Daly. The Outing weekend promises non-stop entertainment with live music performances by international Irish girl band B*witched, Eden 'Electro Pop' and Jonny Woo, queen of London’s alternative drag scene who will perform his show of ‘alt-drag performance song book’. Expect nightlong festivities with Club nights that will feature leading DJs John Sizzle from the Glory London among others, DJ Mo (The George Dublin, Club Tease), and the Confession Club. Those three nights are expected to be the longest, biggest and best ever love party. Another attraction of this fest is the Blind Date event to be hosted by Le Gateau Chocolat, the baritone drag queen diva star of La Soiree and top Irish TV presenter Brendan Courtney. There will also be cruising with ‘Love Boat’, caving, rock climbing, hiking and biking activities and tours to local attractions such as the spectacular Cliffs of Moher and the Father Ted filming locations. Pop-up clubs, drag performances, comedy, ceilis, a drag workshop, the GAZE Film Festival on tour, an art exhibition and interactive events — The Outing promises to be one heck of a bash that you shouldn’t miss. 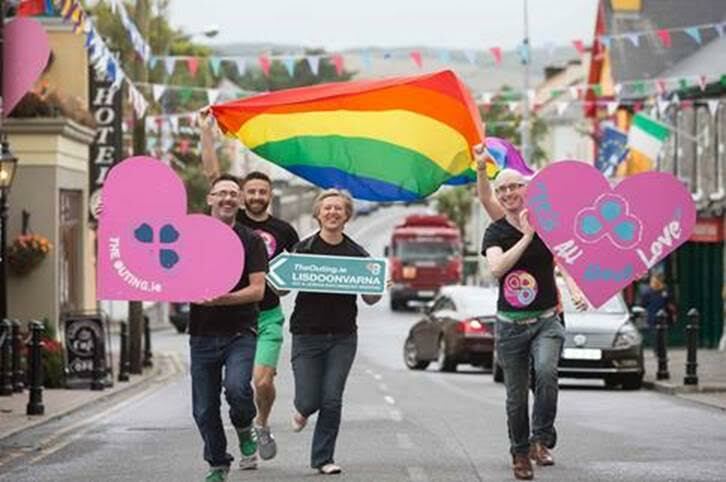 The streets and pubs of Lisdoonvarna await you at this rainbow celebration. From Dublin Airport you need to take a train service.